Ginza is a place where silver used to be minted. “Gin” means silver and “Za means guild. Ginza took its name after Shogun Tokugawa Ieyasu began minting coins here in the early 1600s. The Ginza district was built on western models . Ginza became the mecca of Japanese fashion. Everywhere in Japan, you can find shopping malls with “Ginza attached to their names. The “Hokosha-tengoku” or “Pedestrian Paradise” dates from 1970. The streets are temporarily closed to vehicles for a period of time. Ginza was built on land reclaimed from beaches at the beginning of the Edo period. The name Ginza is derived from the official mint for silver coins established here by the Tokugawa shogunate and literally means a guild of silversmiths. When the first rail way constructed in 1872 between the port of Yokohama and Shinbashi,which is adjacent to Ginza , the nation’s first Western-style building using bricks were built here . Ginza was damaged in both the Great Kanto Earthquake and the Second World War,but flourished again quickly aftetr the war by opening shops for members of the occupation forces. Ginza is also famous as a center of culture and art,having many art galleries and theaters including the Kabuki and Takarazuka theaters. Shoppers can enjoy gazing at the sky. Q Why are there high-rises in Ginza ? Q What is the price of land in Ginaza ? A Land price in the central Ginza area were the highest not only in Japan, but also in the world from the 1980s to 2003. In 1990,prices hit a record at 58 million yen per square meter. After the collapse of Japan’s Japan’s bubble economy, the price of land in Ginaza declined to around 10 million yen per square meter in 2000. It started to recover in 2002,reaching 39million yen per square meter in 2008. 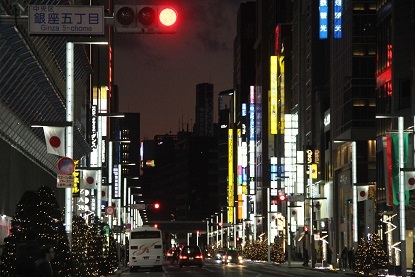 Ginza maintained its seat as the most expensive land in Japan. Q What made Ginza so famous ? A When the first train station was built in adjacent Shinbashi,Ginza started to develop into the country’s first modern shopping center,with shops in brick building equipped with Japan’s first gas lights. Because Ginza recovered quickly from war damage ,many department stores and famous shops were attracted to the area. For foreign tourists Ginza is one of the easiest places to wander around because of its layout, with shops built along the two main street. Q Is it true that Ginza was once on the coast ? A Yes, the Ginza and nearby Hibiya areas were tidal flats and inlets , where local fisherman used to fish and cultivate nori(laver) until Tokugawa Ieyasu established his shogunate in Edo. More land was needed for the increasing population of samurai and townspeople,so the government reclaimed land by bringing in earth from the Kanda area,which used to be a mountain. Q Does the name of Ginza have any meaning ? Gin means silver and za means guild.A guild of silvermiths used to be located here and minted silver coins for the shogunate. Chuo-dori is the street that cuts through the center of Ginza. Stroll here on a Sunday when the street s closed to traffic and the road is dotted with table and chairs. Crowds are thinner than on weekdays,making this the best time to browse through the heavy lineup of Japanese department stores – Mitsukoshi , Matsuzakaya – or window shop at the elite designer goods shop – Chanel , Cartier, Bulgari, Prada, and Tiffany, to name a few. A highlight is tha Apple Store, for the latest in iBooks and iPods.